MEMORY is often an unreliable historian. 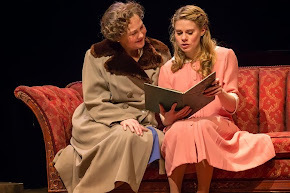 In Tennessee Williams’ great poem of a play, “The Glass Menagerie,” at the Booth Theatre in an extended run through 23 Feb. 2014, memory leads to melancholies of regret. Tom Wingfield (Zachary Quinto), narrator and protagonist, feels the responsibility of disappointment. 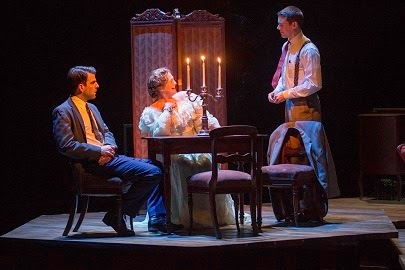 Reminiscence brings him both pain and liberation in “The Glass Menagerie.” (See video above). Tom’s narration weaves a dream-like remembrance of life in the Wingfield household. His mother, Amanda (Cherry Jones), is living in a fantasy of cotillions and suitors past. In her desire to provide a future for her daughter, Laura (Celia Keenan-Bolger), Amanda convinces Tom to bring home a “gentleman caller.” Jim (Brian J. Smith), Tom’s friend from work, is an amiable young man. Laura genuinely admired Jim in their high school days when he was a star on the football field and the stage. Jim has found life after high school less glamorous than he expected, but he is a realist and ambitious. Reality is a breath of fresh air for Laura. She suffers from a crippling shyness as debilitating as her physical impairments. Jim is charmed. Tom (Zachary Quinto), Amanda (Cherry Jones) and Jim (Brian J. Smith) in "The Glass Menagerie. Photos by Michael J. Lutch. Bob Crowley’s off-kilter sets and Natasha Katz’s atmospheric lighting echo the dark moods of “The Glass Menagerie.” Nico Muhly provides wistful and broody music as a backdrop to the proceedings. In a production that is a grand tribute to TW’s esteemed heritage as a playwright, CK-B stands out. Her Laura is not just timid and self-conscious, but radiantly withdrawn. The ensemble benefits greatly from the directness that BJS brings to his portrayal of Jim. Amanda (Cherry Jones) and Laura (Celia Keenan-Bolger) take a picturebook stroll down memory lane in "The Glass Menagerie." Unfortunately, the usually astounding CJ swallows her words as if their full outright forthright expression might be too much for us to bear. All in all, however, John Tiffany’s direction gets the most out of his actors, even if the pacing in the first act seems a bit slow. Visit http://www.theglassmenageriebroadway.com/ to learn more about "The Glass Menagerie."